Give your creativity a boost with these simple but effective tips. How would you describe creativity? Is it an innate way of thinking, or is it more like a muscle that can be developed with regular activity? The jury's out on this one, however what a lot of people do agree on is that creativity can work wonders for your life and career. 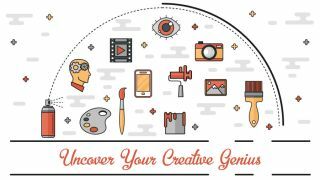 In one of the best infographics we've seen about creativity, Davitt Corporate Partners breaks down how you can uncover your creative genius. Starting off with a quick look at just what exactly creativity is (complete with a snappy quote from Alex Osborn you can impress your friends with at your next dinner party), this infographic goes on to examine techniques that could get your synapses firing in fresh and exciting ways. These include unwinding with a black cup of tea, going for a walk, or simply taking a shower, because who doesn't have great ideas while washing, right? Now before you turn your nose up at the idea of this pseudo-science, ask yourself: what have you got to lose by trying a few creative exercises? At worst you're left in the same position as you were before, but if the techniques covered in this infographic do in fact work, well... you can thank us later.